Discover the grand design of a four poster bed frame that will create an elegant and stunning feature in any master bedroom. 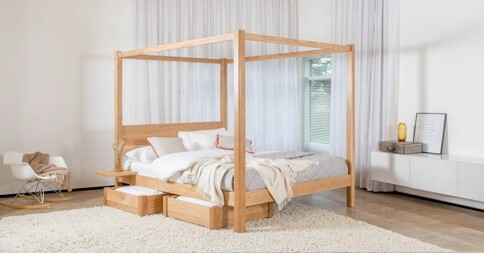 Our range of Canopy Beds are some of our most impressive handmade wood bed frame designs. 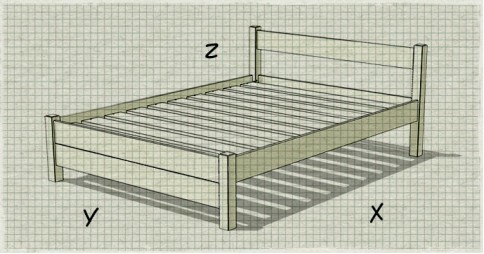 They’re a demonstration of the level of luxury we strive for with each of our bed frames. They make an excellent centrepiece for any bedroom. Showcasing contemporary design that’s a modern take on traditional canopy bed frames, we’ve revitalised an iconic part of traditional British history. 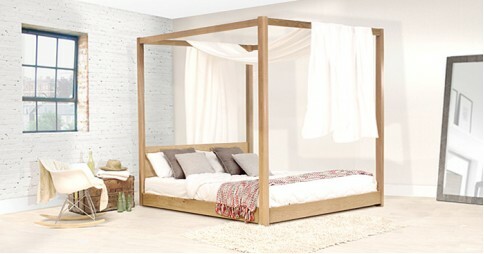 The Classic Canopy Bed stays the closest to the traditional designs of the canopy beds from the past. 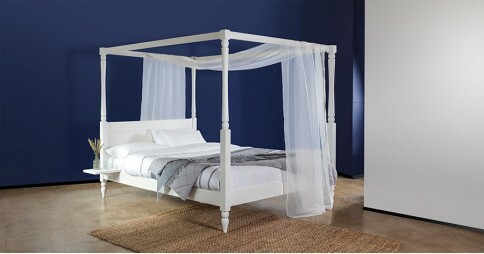 The handmade Summer Canopy Bed frame is a refreshing place to relax during the warmer months, whilst the Low Canopy Bed is the perfect minimalistic choice for those that have a restrictive ceiling height in their bedroom. All of our wood beds are handmade by our experienced team of dedicated craftsmen at our workshop in Leicester, the heart of rural England. 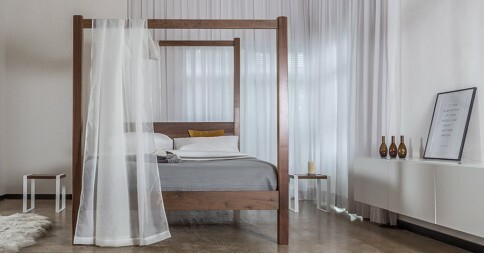 In order to be sure we maintain a high standard of quality for each of our handmade wood canopy beds, they are all subject to thorough quality checks for both cosmetic and structural standards. 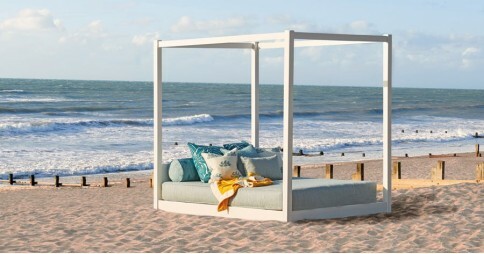 Once checked, they’re flatpacked for ease of transportation, both in transit and into your home - nobody wants to drag a fully assembled bed up their stairs, especially a canopy bed. All of our handmade beds come with an 11 year guarantee as an assurance of the faith we have in their quality. We also provide bespoke alterations to your bed according to your needs, should you require something specific for your bed frame such as a change in height, width, or more, we can make your bed to suit you. Bespoke alterations aren’t the only customisation service we offer. If you’re looking for that finishing touch to your bed frame then we offer the opportunity to personalise it with a different colour finish. There are ten luxurious satin finishes available, such as subtle black, bright white and a refined grey. As a standard, we construct our wood beds from Solid Scandinavian Pine, but if you’re after a more natural looking bed frame, you also have the opportunity to have your bed constructed from one of eight Solid Hardwoods that we offer. 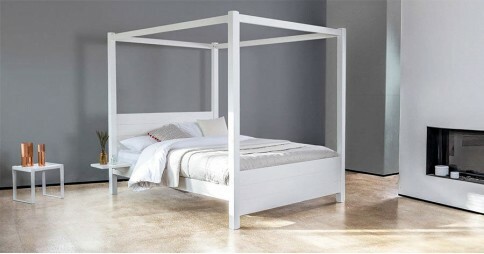 Popular choices include Oak, Walnut and others, perfect if you’re looking for a centrepiece for your bedroom. These options are available for every one of our handmade wood beds in order to provide the utmost of comfort and stability, contributing to a good night’s sleep. We’re proud of our beds and should you want to find out more about our canopy beds, or any of our wood beds, get in touch over the phone on 646 8512943 or simply email us at hello@getlaidbeds.com.